In Steven Spielberg’s brilliant film Munich, one cannot help but wonder if Israel’s Prime Minister Golda Meir (Lynn Cohen) thought about the above passage when she finally gave the approval for Operation Wrath of God. You won’t hear that name during the film, but that is the name that was given to the revenge operation approved by PM Meir after the September 1972 massacre of 11 Israelis who were taken hostage at the Munich Olympic Games. It was an event that transfixed the world at the time and Spielberg brings it back to life using actual footage of Jim McKay’s narration of the events alongside with his recreation of the hostage-taking and the events that followed. We don’t see them all at once, Spielberg cleverly reserving many of these sequences to be sprinkled in throughout what follows the opening tragedy that resulted in the death of all 11 Israelis and all but three of the Palestinian terrorists. What happens afterward is that Avner (Eric Bana), a low level operative of Mossad is recruited for an operation. An operation that he doesn’t find out until afterwards is to hunt down and kill 11 of the terrorists who were responsible for organizing the Munich Massacre. He is brought before the PM herself and she assures him that he is doing what must be done. Of course, before he can be sent off to Europe, first he must resign from the Mossad, and sign a contract saying that he is no longer employed by them and that in essence, he doesn’t exist. Neither do his four teammates, Steve (Daniel Craig), Carl (Ciaran Hinds), Robert (Mathieu Kassovitz) or Hans (Hanns Zischler), all of whom have special skills that they bring to the team, although none of them is a trained assassin. That is something they are all going to have to learn on the job, as Ephraim (Geoffrey Rush), their case officer explained to Avner going in. Ephraim has also told them they are to work in Europe, to stay out of the Arab countries, and not to return to Israel. For Avner, who has a wife who is seven months pregnant, that will not be an easy order to obey. However, the order to search out and kill those who are believed responsible for what happened at Munich will be very easy to obey. The question is, just how do you do that without killing any innocent bystanders, and do it while not getting you or any of your team members killed? 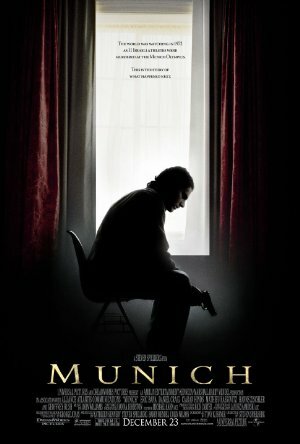 Munich is not just about what happened in the Olympic village and at Furstenfeldbruck (the airfield where 9 of the 11 hostages died) it is about the search for Vengeance, which happens to be the title of the book that the screenplay by Tony Kushner and Eric Roth is based on. The book, written by George Jonas was originally published in 1984 and was been re-issued in 2005 with a new commentary by the real “Avner”. It is a fascinating read and while some have questioned its authenticity, Jonas stands steadfastly by its accuracy. This is one of Spielberg’s best films, if not the best ever. The authenticity of the era is captured throughout in appearance and sound. The textures of the cinematography are incredible, with a wonderful feel that are just plain fun to look at. Eric Bana’s performance as Avner may not be the one that ends up winning the Best Actor Oscar for 2005, but if he isn’t one of the five nominees come Oscar time, there’s something wrong with the nominating process. I am going out of my way to avoid spoilers, but there is a moment when he is on the phone with his wife after she has given birth and he speaks to his child that may be his best moment in the film. Kudos also to the entire membership of the Kidon (Mossad’s name for hit team, in Hebrew it means bayonet), as Craig, Hinds, Kassovitz and Zischler are all very good, and Geoffrey Rush is particularly good as the epitome of a case officer managing a team in deep cover. I could quibble with Munich for ignoring the Israeli failure at Lillehammer in July of 1973, but Spielberg’s work is so good, I’ve decided to overlook this omission. If you want to know what happened there, read the book by Jonas, he makes a quick mention of it. But don’t miss seeing Munich in the theater, it is a masterpiece. Plot: Based on the true story of the Black September aftermath, about the five men chosen to eliminate the ones responsible for that fateful day.